As a mother of five, Margaret Bangura is committed to helping women give birth safely in her country of Sierra Leone where infant mortality is high and many young mothers suffer from complications. In Lunsar, Sierra Leone, at St. John of God Hospital there is a large courtyard filled with trees at the center of its buildings. I was sitting in this beautiful spot with Margaret while she recalled her joy at becoming a newly qualified midwife the spring of last year. At this time, St John of God’s was the main source of health care for a population of nearly fifty thousand people and was well known locally as a place where women would come to give birth safely. By the end of July Margaret said her conversations with her fellow midwives at St John of God’s had become very anxious and repeatedly returned to a single topic – Ebola. Margaret could feel the stress amongst her colleagues and staff rising as the virus had started to spread across Sierra Leone. But the work of the midwives carried on regardless, helping mothers to deliver healthy babies. Any doubts that Margaret had about the risk that she took each day at the hospital were forgotten when one of her friends, a nurse on the surgical ward, died from Ebola. She began to notice a sharp fall in the number of women coming to have their babies delivered as well as the fear in her patients’ eyes when they entered the hospital. With more and more doctors, nurses and midwives at the hospital falling ill and 8 sadly dying from the virus, the hospital was closed on the September 24, 2014. Margaret and her colleagues now spoke of their despair and the plight of the women and babies who had nowhere else to go. They lamented the innocent victims whose deaths were not from Ebola directly, but were just as tragic because they could have been prevented with basic antenatal and midwife care. Despite the risks, it was the determination of health workers and midwives like Margaret wanting to return to work, which convinced St John of God’s new Director, Brother Michael Kamara, to find a way to re-open the hospital. Knowing that International Medical Corps is the leading expert in Ebola treatment and prevention, due to the operation of an Ebola Treatment Unit and Ebola training facility at nearby Lunsar, Brother Michael Kamara came to ask International Medical Corps for help to make his hospital safe from Ebola and to help rebuild the trust of local people. 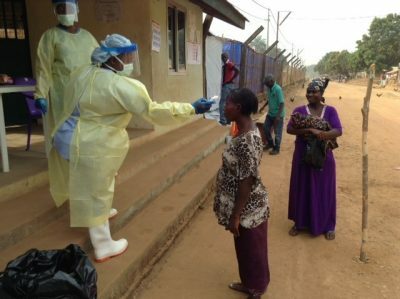 International Medical Corps has now trained more than 660 health workers, 500 of them Sierra Leone nationals, in treatment of and protection from Ebola. The Lunsar training facility has two classrooms and residential accommodation for over thirty trainees but the transformational facility is a mock-up of an Ebola Treatment Center where the trainees can practice in a safe environment. On completion of their training, doctors, nurses and midwives have begun to work in the network of International Medical Corps Screening and Referral Units (SRUs) throughout Sierra Leone. At the St John of God Hospital 150 patients were screened in January alone, four of whom were transferred to a nearby Ebola Treatment Unit and three eventually confirmed with Ebola. This means that 146 patients were able to receive care at the hospital, safe from infection with the disease. International Medical Corps made the St John of God Hospital a haven once again for pregnant women and new mothers. A triage facility was set up at the hospital gates, so patients could be screened and referred to the nearby Ebola Treatment Center, keeping the virus out of the hospital. Meanwhile Margaret and her colleagues embarked on an intensive training in the use of personal protective equipment and other approaches to Ebola prevention. It was a slow process winning back the people’s confidence but despite the loss and fear she had endured, Margaret’s resolve never faltered. All her life she had wanted to be a midwife and she was not going to let Ebola prevent these women from having safe births. Margaret knows that there is still a long way to go. Women are still reluctant to come in to the hospital. She and her friends spend a lot of time going out into the surrounding villages talking to women in their homes. The strategy seems to be working. A trickle of patients are coming back and it was no coincidence that the first two people to enter the re-opened hospital were a pregnant woman and a two-year-old child. The first two patients at the reopened hospital – a pregnant woman and a new born baby.